We are well into fall and I couldn’t be more excited. At the farmer’s market the other day I was happy to see the return of some familiar faces — winter squash, apples, pomegranates, persimmons and the entire Cruciferous family of vegetables. Have we talked about this group and why you should be inviting them to dinner as much as possible? Broccoli, cabbage, Brussels sprouts, collard greens, kale, watercress, mustard greens and cauliflower are the most popular around here, but there are others and they are all loaded with powerful anti-inflammatory and anti-cancer compounds. You may hear the term “super food” liberally thrown around a lot, but these guys are the real deal. Remember when I told you I have a favorite way of eating every vegetable? 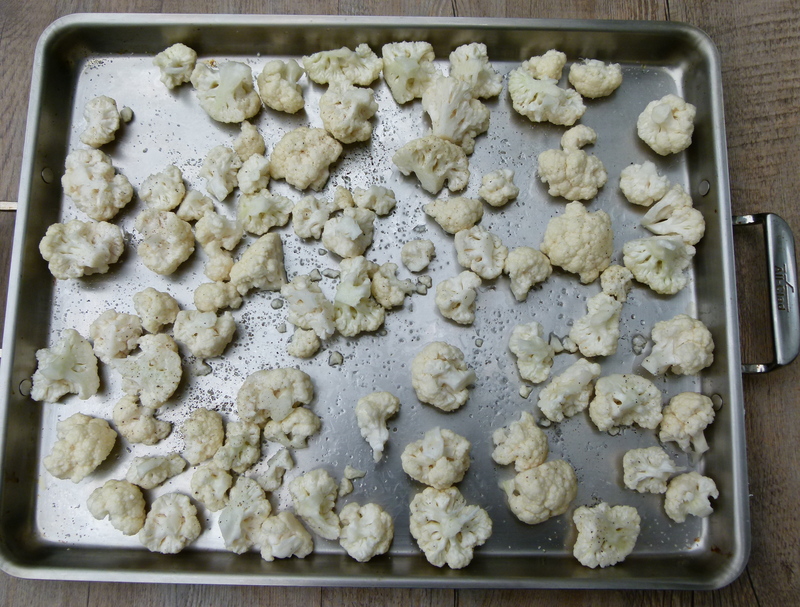 Well, my most favorite way to eat cauliflower is roasted. Have you done this? It becomes tender and sweet and my kids can’t keep their hands out of the baking dish. When was the last time you said that about cauliflower? When I saw this recipe in the Los Angeles Times food section a few years ago and noticed the roasted cauliflower element, I knew I was in. It’s an adaptation of a Thomas Keller recipe, one that I would not normally look at since he’s very cheffy, but it didn’t look complicated. I wanted to change it a bit and substitute brown rice for white and cut out what looked like unnecessary amounts of fat. What still baffles me about this recipe is that Mr. Keller calls for 1/2 head of cauliflower and 1 cup of rice to to feed 8-10 people. I actually upped both to feed half the amount of people. Are my kids bigger eaters than the people who gather at Ad Hoc? 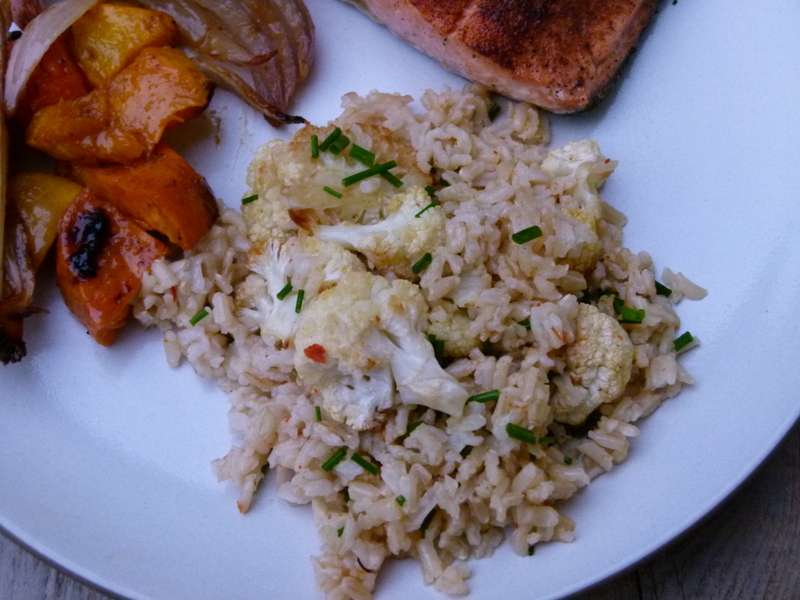 Mr. Picky eats more Basmati Rice with Roasted Cauliflower than Ad Hoc patrons? Maybe Mr. Picky ain’t so picky! All I know is that this has become one of our favorite side dishes. Yes, go ahead and use whatever rice you’ve got, but if you haven’t tried basmati, let me change your life right now. It rocks the rice world. 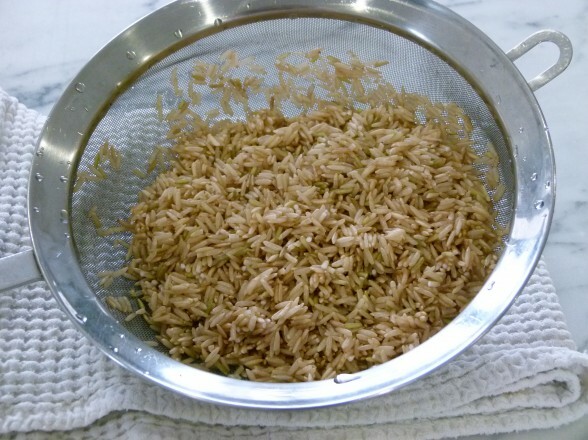 Basmati rice (I like brown) has this lovely fragrance and grassy flavor which you can taste without even adding anything to it, although a little butter and salt never hurt. As you can see, I made this the other night with Spice-rubbed Wild Salmon. Since Daughter #2 is still being stubborn about not eating fish and seafood and I’m not making more than one meal for dinner, I tossed some sliced almonds onto her rice and cauliflower and called it a vegetarian entree. After all, this ain’t no restaurant. Make the rice: In a medium saucepan, add the water and 1 teaspoon sea salt and bring to a boil over high heat. Add the rice, butter and chili flakes and reduce the heat to a gentle simmer. Cover and cook the rice until the liquid is absorbed and the rice is tender, about 50 minutes. Fluff with a fork. 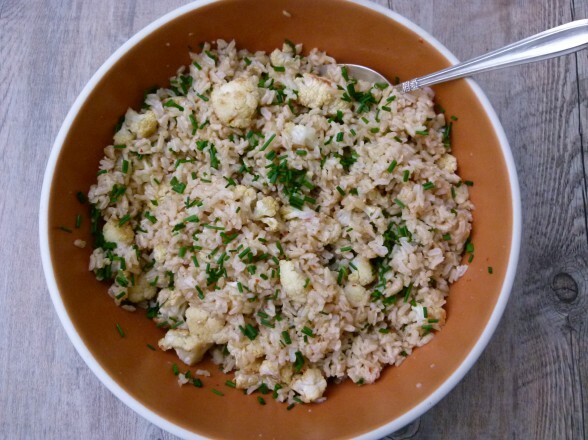 While the rice is cooking, toss the cauliflower with the coconut oil in a large bowl and season with sea salt and ground black pepper to taste. Save the bowl for later. Place the cauliflower on a stainless steel baking sheet or one lined with parchment paper and roast until tender and golden brown, about 20 to 30 minutes. You can turn it a couple times for even cooking and coloring. 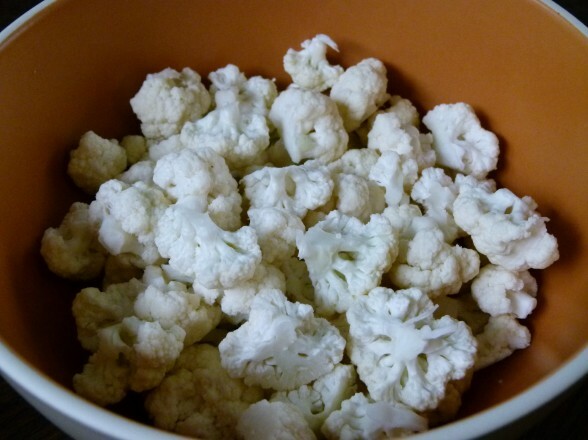 Place the roasted cauliflower back in the bowl and toss with the curry powder. Season with sea salt and pepper, if desired. Add the cooked rice to the bowl and gently toss. Sprinkle with chopped chives and serve. Suggestions: you can add sliced almonds if you are serving this as a main dish. **If you double this recipe, do not double the water. Use just under 5 cups. Family doesn’t like curry… any substitute? well curry is THE flavor here! maybe a little cumin and some fresh cilantro at the end? I was craving this recipe from our cooking class about a year ago and, ironically, made it the day before you posted it on your website. My basmati rice came out mushy and sticky though not delicious and fluffy like I remembered it when you made it. Any hints as to why this happened? Give it another try and let me know how it goes. This was a great recipe! I really enjoyed the combination of the curry and chives with the rice and cauliflower. This was delicious. My picky daughter loved it! I’ve seen many kids enjoy this recipe. So glad yours did, too! Had this last night and we truly enjoyed it. Another wonderful recipe from you! I have made this dish many times and the whole family loves it. The roasted cauliflower by itself is so yummy!!! True — just roasted cauliflower as a side dish is delish. I like using coconut oil since it stands up to high heat better than olive oil and it has a sweeter taste, but olive oil can be used with great results. Looking forward to trying your recipe. I make a variation on the theme by mixing brown or even wild rice with roasted broccoli, red peppers and onions (or red onions). At times I even add cooked garbanzos. Before serving I drizzle some olive oil over the mixture. Have you ever tried Lundberg’s rice blend? I love that! I don’t know what I enjoy reading more, the photos or your words! I’m making that dish tonight! My husband is a lucky man thanks to you!! We both know why your husband’s lucky — and it has nothing to do with me! Hope he likes the rice!